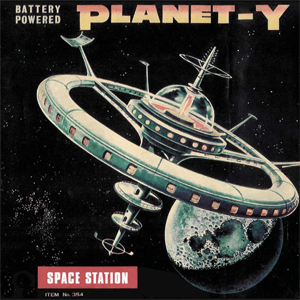 PLANET Y - "Space Station"
This is a 28-minute live excursion by Yanni Papadopoulis (Stinking Lizaveta) on a Casio digital synth-guitar and Charles Cohen (Philly music veteran) on Buchla synth, who together on Nov. 17th 2006 whipped up quite a sound in a Baltimore Cathedral. Things start off slow with a haunting dirge-beat...and these beats don't pound like modern electro, more like the earlier analogue programming of classic Krautfits such as Cluster, modern groups like Vocokesh, Exit Terra, and so on. A bed of carbonated soda-synth creeps around, you've got yer airy trumpet-synth leads, dub echoes...a plethora of cosmic, perhaps violent, electronic bursts before the beat slides into a more hurried pace and a beautiful frenzied assault of rythmic wavering lines, radio noise, pluckings, knockings, squiggles. The Space Station at once transmits and receives, and, not always stationary, voyages through friendly and hostile galaxies, pauses in playful time-warp purgatory twiddling the avant-whim, never staying or going for longer than a few of your earth-minutes. Earlier beats and keys reprise themselves...the last five minutes cool down a bit in percussive outro. This is a strong, at times exhilarating piece; the boys maneuver, switch-up and improvise their special little machines with aplomb...should please fans of the classic, pure electro-percussive ambient-space.